Serve up all your favorite hot beverages in this Choice 10 oz. white paper hot cup! From hot cocoa and coffee to tea and warm cider, this Choice cup is an economical option for your cafe, coffee shop, kiosk, or concession stand. With a poly-coated inside, this cup resists condensation accumulation to protect the outside of the cup from weakening. Featuring a tightly rolled rim, this cup provides worry-free, leak-proof drinking and creates a tight and secure seal when used with a compatible drinking lid (sold separately). We have Coffee Time each week and we are so thankful for having cups that are cost effective and our coffee drinkers enjoy the simpleness of the cups. Trying to end my personal use of all single use plastics/foams. These paper cups are perfect for morning coffee to go ( I lose every reusable cup..ever) and for cold beverages. Have not had an issue with leaks or stability. Others have complained about the transfer of heat while handling hot beverages..yes, it's hot, use a napkin to hold it for 5 minutes..you will be fine. It's worth not adding to the billions of pieces of plastic and foam littering our planet. I highly recommend this product. We love the Choice cups sold on Webstaurant. The best part...the 10, 12, and 16 oz all have the same lid! Very good quality. These are used for all our hot beverages. Very useful for our hot beverages we serve, such as hot honey ginger tea and hot hobeybcitron tea. In addition, we use for Japanese Tea.. sharp looking! These are a perfect size for coffee. There are all white and it was great for my wedding reception. They make lids to go with these as well but I did not order them. I wish I did I definitely recommend these!! Great cups at a very great value! These cups are also very versatile and can be used with a lid for coffee as well as for water. Additionally we have found them very useful in craft projects. We use this cup for our cappuccino. Feeling of grip is good and the lid is really fit well with any other brand of lid. That is key! I love these cups - they are a perfect size for our shop, as a cup of coffee is an "add on" item, not a stand alone. I am able to keep prices reasonable on my coffee because of the smaller serving size. We used Choice 10 oz. White Poly Paper Hot Cups as part of a hot chocolate bar at a wedding last month. They were the perfect size. And the blank white design allowed us to customize the drink sleeve to fit the event theme perfectly! These cups are great! I love being able to serve paper cups instead of styrofoam ones and not pay that much more for it. These cups feel great in your hands and last a while with hot liquid in them. The 10 oz cup is great for portion control, yet still having a higher quality feel and look to them. Choice poly paper hot cups are a great purchase. We always prefer paper to foam or plastic for environmental reasons. They are poly coated to prevent condensation and leaking. Nice clean design. Would recommend a sleeve because they do get hot with fresh coffee or tea. I use the 10 oz hot cups for hot lattes. This is the perfect size for a double shot of espresso, frothed milk and flavoring of choice. These cups are fabulous! They offer a very clean look and are very affordable! We utilize them in our resident lounge where coffee is available 24hrs a day and they are a hit! I order 1000 cups every month! Loved the feel and size of the cup to serve soup in, however it does not deflect the heat as expected. i had to double the cups to ensure guest did not burn their hands because it was hot to hold. Be careful or buy additional cup sleeves. This size is great for serving hot cocoa to the kids that come into the coffee shop. Choice brand is good quality and good price. Great sturdy hot drink cups. We used them for coffee and hot cocoa at a wedding. The 10oz size allowed the guests a reasonable portion while limiting how much drink waste was potentially tossed away. This is the best coffee cup ever i use for my business. This cup is the best and everybody loves it and i am going to reorder it. A nice plain, white paper hot cup that is great for our family get together parties. The ten ounce cup is a great size for our cider and really pairs nicely with a sleeve. We really like these cups for holding hot liquids. The poly cups do not burn your hand and the material holds up for multiple uses. This is a great cup for a small coffee to go. We will use this for coffee or tea, and sometimes our espresso beverages can be placed in these cups. 10oz white poly paper hot cups are the best. The size is perfect. The quality is just outstanding. They don't melt and keep the liquids hot for a very long time. We highly prefer plain white cups. They look clean and you can stamp your logo on the side. These Choice brand cups are low priced and come in packs of 50. A very great deal and they will ship directly to your door. These Paper Hot Cups are good quality and are very well priced. We purchased these for our office and everyone enjoys using them for their coffees. The Choice 10 oz. hot cups definitely exceeded my expectations. They are great to have for a quick cup of coffee or even water. Great quality and price! I got these to use with my keurig for on the go. I got this size for when i make the 8 ounce cup option to allow room for cream and whatever else. These are great for the price. Unfortunately, they dont really do much to keep the coffee any warmer than it would stay in any other cup or mug. With my keurig i didnt find it necessary to use a cup sleeve with these, they didn't seem too hot to handle directly after brewing. These do stain easily if coffee gets on the outside of the cup. doesnt hurt the quality of the cup itself, just a slight annoyance. I would purchase these again. Great size for one serving of a hot beverage. We use these for our coffees, speciality drinks, and hot cocoa. Thick and sturdy paper, not flimsy. Keeps beverages hot for a decent amount of time. However it can be hot to the touch, cup sleeves are an option. We use these for coffee and they work great. They keep the coffee warm and they look sleak and clean. WE have them in other sizes as well. These cups easily hold hot liquid without losing their structural integrity. The 10oz size is perfect for an after dinner cup of coffee. I would recommend purchasing the lids and sleeves that go with them, as the outside can get a little warm depending on the temperature of your beverage. 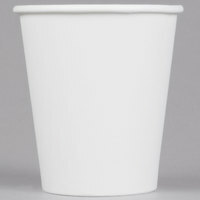 The Choice 10 ounce white poly paper hot cup is perfect for serving our small hot cocoas. The cups are great for writing on or stamping your own logo. Great value for these 10z white paper cups. Poly coating inside to protect and minimize condensation. You can write your customer's name or stamp your logo or decorate however you wish. Very versatile! These are great cups for the money. I use them when I take coffee into my husband’s office...I don’t want to spend a lot on something that’s going to be used once. However, I do wish that they were 2 ply. Some work great, while others have defect and leak…but there’s no visible sign of which ones will or not. So, you have to always take extra in case this happens…and what a mess it makes. But, it’s still cheaper than getting them from the grocery store and I can’t stand Styrofoam cups since they aren’t recyclable or compostable. Easily the best priced for the quantity received. We are more than happy with how durable these are for disposable cups. These will be perfect for coffee drinkers at our fall wedding. I used these recently for serving soup to guests as they entered a party venue. They are a very sturdy cup that served the purpose very well. Choice sleeve was used with this to avoid hot hands. Great price. I ordered these 10 ounce coffee cups. They are sturdy and clean visually and internally. Definitely a great value for a delicious cup of coffee. I liked this product choice because I was able to get a variety of size options at a good price. I am using them for my wedding, so the color was perfect! I also enjoyed the fact that the paper was heavy enough that it wouldn't break down easily once hot drinks were poured inside. I also thought the thickness was good, so that the contents inside wouldn't be too hot for someone to hold onto. We had to get these cups because Dart's 10oz cups are a smaller diameter and don't fit the universal black coffee lids you see a lot of places. These cups are much better, the lid snaps on tight and the size is great for small coffee drinks and kid's sizes. Good sized cup, sturdy cup for hot beverages. Good price and good cups for any type of business. I even use these for bone broths. . This is a good basic cup which meets the needs of our coffee shop well. It would be great to have in black, but the cup looks great with a black lid and I sleeve. No problems with the cup collapsing. These are really cute little cups. Perfect size if you're watching worried about having enough of something. A good price value as well, came packaged great! This is a classic classic colored white hot cup. You can use it for most any beverage, and if you'd like yiu can stamp a logo on it. Great product! Quality is amazing, has been ordering this for our church hospitality table, can't compare with anything else. The price is also grate! Thank you ?? Perfect size and simple design. Can't beat the price here. Depending on how many cases you buy these are very inexpensive per cup. These cups are ideal for hot beverages. A large majority of our employees drink hot beverages, whether tea or coffee. With these cups we don't have to worry about burning hands when carrying back to their desk. These coffee cups are exactly the same as another cup vendor we had purchased but so much less expensive! Very very sturdy and great quality! The cups are good, strong quality, and I prefer the smaller, 10 oz size. I use these for coffee or tea, and occasionally to put pretzels or goldfish in for a snack in the car. They're plain white so you can use them for anything. The only downside to the 10oz size is if you buy the sleeve to protect your hands from the heat, they kind of fit on a little funny, like the sleeves are too big for the small cup. I ordered these along with the sleeves. The cups are nice and sturdy. They are the perfect size for serving hot cider, tea or coffee. The price makes them a good value. I ordered these to use for a youth activity at church. Everyone designed their own cup. They are a great size for small children, and are great quality. The markers took well to the cup and didn't smudge or run. I will definitely be ordering more. Sturdy, good quality cups that worked well for us. We used them for giving away hot chocolate at a large, winter time community event, and combined the cups with personalized cup sleeves. These cups are very good. Just make sure you order the correct size tops. The cup does become very hot. I order sleeves as well to take care of this. These cups are neat, inexpensive, and durable. They're sturdy enough to handle the hot coffee and espresso drinks I put in them, but polished looking as well. Wee were using 8oz paper cups at work, but then when we changed the coffee machine to a newer keurig with more cup brewing sizes, we changed to the 10 oz. everyone is happy now. Loved these coffee cups. They are a nice and they are good for coffee and for tea. The price is right and I will order again. Used the Choice 10 oz. White Poly Paper Hot Cup - 50 / Pack to hold a tropical punch koolaid drink. 10 is just the right amount of koolaid. Not too much, but not too little. I bought these as favors for my friends wedding. We gave them to-go lids, a hot sleeve, and filled them with hot chocolate packets that each guest could then take home with them. Perfect for a January wedding. These are nice sturdy cups at a very good price. They don't get soft or leak even after sitting hours with liquid in them. I think they are best used with a sleeve but some of my customers say they are comfortable to hold without one. Nice cups and exactly what I wanted.. Great product if you want to serve hot drinks and also for cold drinks.. Good value for the price.. Awesome value and price. I purchased this item as part of a wedding favor. The wedding planner was amazed at the price and the quality. The guest fell in love with them. I would recommend this product to anyone. I love this item. These were the first cups we started using when started our coffee pop up business. They don't look cheap like other hot paper cups on the market - these actually feel like paper and not plastic. The wider mouth and rim allow for a better hold in the hand as well as being able to showcase some really awesome latte art. These are truly the best hot cups to give to your customers. And don't be afraid to put your mark on them - logos look fantastic on them. Very sturdy cup, it is of the same quality as any coffee shop cup that I have eve been to. If you have very hot beverages then you may want to get sleeves to go with them as well. Overall this cup is exactly what I was looking for and I will be reordering. Great product to have whether you are serving Hot or Cold beverages, We have these in stock all of the time at the bakery for customers. Nice crisp look to these cups and works great with hot coffee. We use the black eccosleeve on them and they look great! They also are compatible with the lids we currently use. These are not the greatest quality, and even with the sleeves they are burning hot and leak at the bottom. Pretty disappointing to have to throw these away! Thank you for your review! We are sad to hear that these cups have been causing problems for you. A Customer Solutions Representative will contact you soon to resolve the issue. Great for hot chocolate because the cup is small I usually only sell a 8 oz portion. This gives a little extra room at the top. Perfect coffee cup size. good price. I would buy again. guests love this cup. using it for coffee and hot cocoa. it doesn't leak at all. These paper cups work nicely for serving any beverage, from smoothies to hot coffee. Be sure to order the sleeves if you're going to use these cups for serving hot coffee, as the cup is not insulated and will get hot on the fingers. I like the plain, clean look of the cup and they do look nice with the sleeves. This was the first product I bought from Webstauantstore.com. The cup is nice however you really need to have a sleve to protect the customer. I had an event this weekend and this was the only concern on my part. This is a great product. We used it to sponsor a local freelance event among others. They came very handy for attending guests and hosts. Great cups of events with lots of people and a low budget. I actually order these for my grandmothers church and they always call me to order more when they get low! great product!